Erica Bunker | DIY Style! 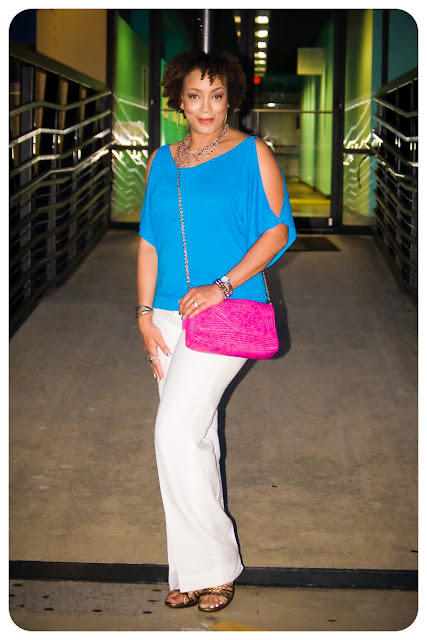 The Art of Cultivating a Stylish Wardrobe: Inspired by Pinterest | Giving the Cold-shoulder! When I pinned this, I did it with the intention of recreating this look. I love these colors and their vibrancy. 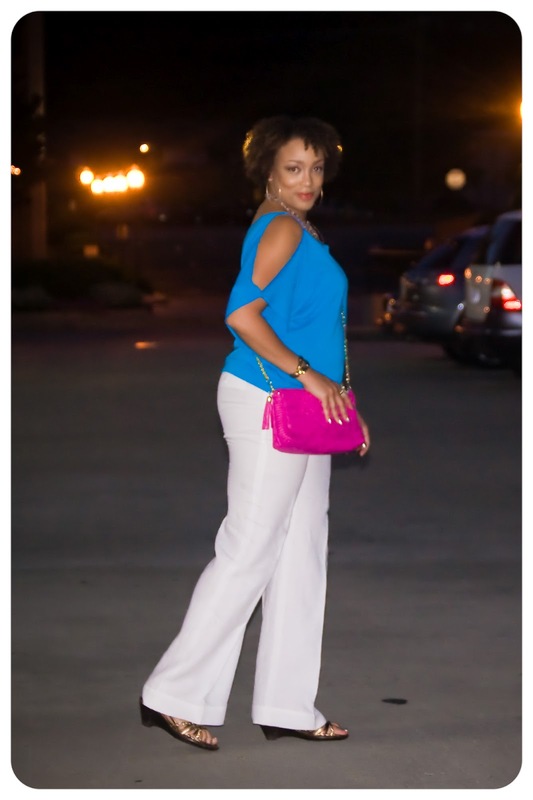 And there is nothing like a crisp pair of white linen pants! This outfit really brightened up a rainy day... and my mood. 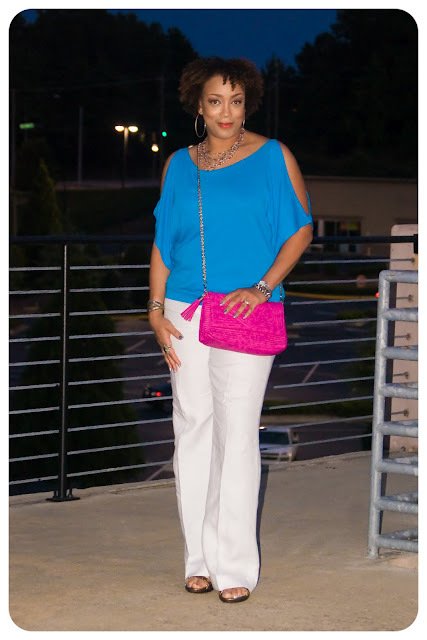 Wearing: top: McCall's 6287; pants: Talbots; purse: Urban Expressions; wedges: Sofft. 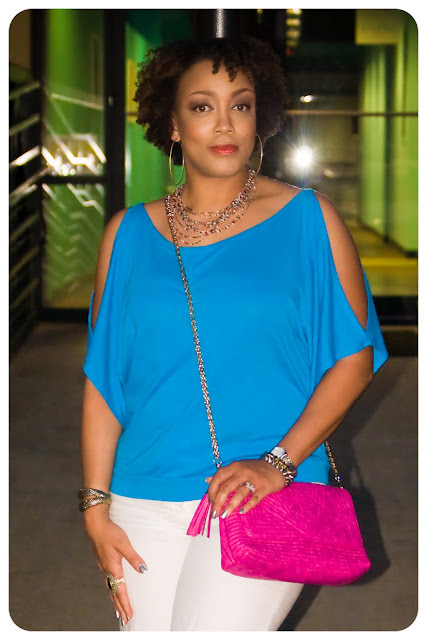 Great outfit, I love the colour combo too and the pop of unexpected colour in the bag. I've got to start pinning more outfit ideas, I'm just no good at putting separates together. Allison, Pinterest definitely would help with that. Thanks! what an awesome outfit! The colors are so bold but the looks is so simply chic. Bravo! btw, love your makeup in this post. would you be willing to let me know what you're wearing on eyes and lips?! Thanks Anahdara. I use a Sephora Collection palette. It has many, many colors and I just apply whatever strikes my fancy. I LOVE these colors! What a gorgeous top! This is a pretty terrific outfit. I think you have convinced me to finally sew that white linen into a pair of pants. Thanks for the inspiration! Thanks Beryl and good luck with your pants! Once again, you have totally trumped the inspiration! Great colors and great outfit Erica. I wish I had your hair. Pretty as always. You always look better than any look you are recreating. Beautiful. This outfit is sensational Erica - you look better than the model from the outfit you copied! Love the slashed sleeves too... Impeccable as ever! Beautiful top Erica! I'm tempted to try this pattern now. What type of fabric did you use? Thanks GV! I used a very lightweight rayon jersey. It's a t-shirt weight. Classic, yet sassy and modern. I shy away from color typically but this is inspiring. Thanks Sassy Sensible Style! I use to also shy away from color. Embracing it is so liberating! Wow! This is such a beautiful look and an amazing recreation! I just love it.